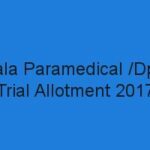 Kerala LBS Centre invited online application for admission to Professional Diploma Courses 2017 in Pharmacy, Health Inspector and Paramedical Course under the Government / Self Financing Institutions in Kerala. Candidates can apply online through LBS website www.lbscentre.in. 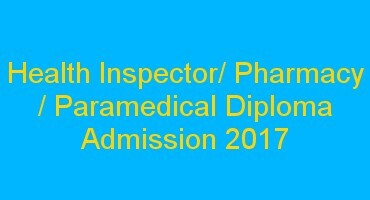 Online registration for Pharmacy/ Health Inspector Paramedical Diploma 2017 can be done upto 28th September 2017 at 5.00 PM. Candidates must visit the web site www.lbscentre.in to complete the LBS online registration for Paramedical professional diploma courses 2017-18. The applications are invited for admission to professional diploma courses in Pharmacy / Health Inspector / Paramedical under Kerala government/self-financing institutions in Kerala. The eligible candidates can register online application on LBS web site. After the completion of online registration LBS will be publishing a trial allotment. After the trial allotment, Health Inspector / Paramedical Diploma First Allotment 2017 will be published. Diploma Courses 2017-18 details are listed below. Rs 200/- for SC/ST candidates. The candidates can make payment for the application fee through Federal Bank branches in Kerala. Age Limit : Completed 17 years of age on 31-12-2017 and upper age limit is 35 as on 31-12-2017. D.Pharm : Candidates must have passed 10+2 / VHSE with Physics, Chemistry, Biology, Mathematics / Biotechnology / Computer Science as optional subjects. There will be 3 stages for the submission of Application form and all stages are mandatory. Candidates shall complete all the stages of submission as per the time schedule. Stage 2 : Confirmation of Personal Data Registration and forwarding of the printout of the application form with supporting documents. Stage 3 : After publishing the provisional rank list the candidate has to register college/course options during the prescribed time.